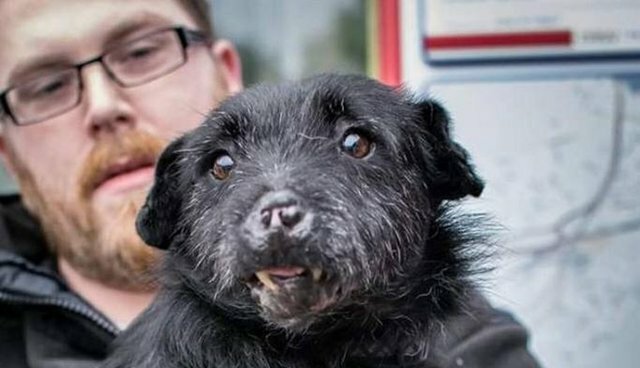 When Paddy Lawson saw the photograph of the disfigured shelter dog at Rossendale Responsible Rescue, he knew he wanted to foster him. 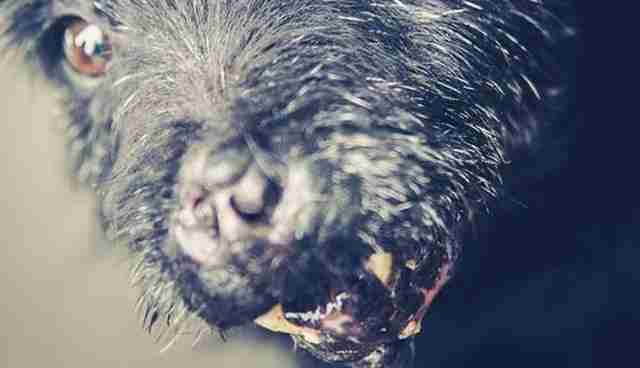 The Patterdale terrier had lost sections of his jaw and nose, and his teeth stuck out at odd angles. While Rossendale Responsible Rescue has a strict no-kill policy, Paddy knew that this dog wouldn't be easily adopted. 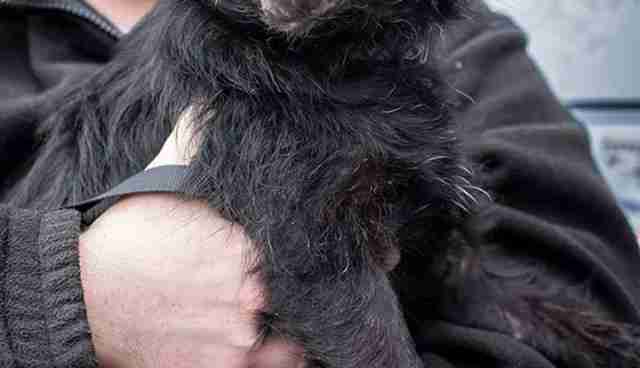 Michaela Holt, founder of Rossendale Responsible Rescue, initially expressed her concern. "Are you sure you can cope?" she wrote in an email to Paddy, who was a close friend of hers. Although Michaela knew Paddy had plenty of experience with dogs, she worried about this dog's background. 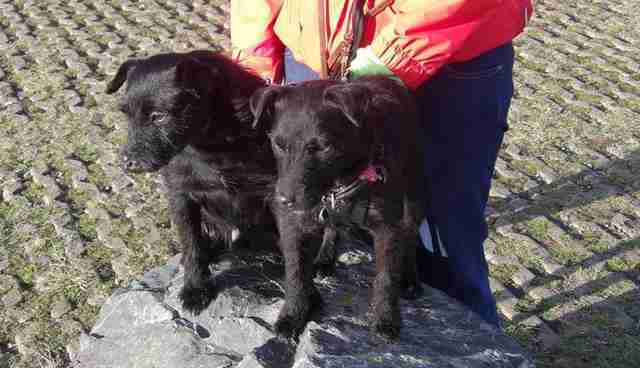 The Patterdale terrier - named "Sab" by the rescue - had been found wandering around a reservoir in Rossendale, England. 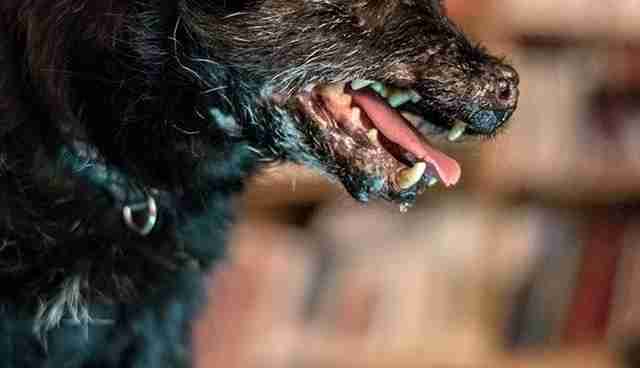 Based on the dog's facial injuries, rescuers believe the terrier had been used in "badger baiting," a cruel practice where humans train dogs to drag badgers from their burrows so they can rip the badgers apart. Badger baiting has been illegal in the U.K. since 1835, but the blood sport has been making a disturbing comeback in recent years. What Michaela worried about the most was how Sab might behave around children, as well as other dogs. Paddy wrote back, telling Michaela how his late father was the kind of person who mistreated dogs, and that he wanted to do anything he could to help Sab. "I've spent my life around working dog breeds trying to put right the sins of my father," Paddy wrote. "I've got the time to put into this dog. I wouldn't have offered if I wasn't sure." So after Sab's mandatory seven days in the shelter (in case someone claimed him), the Lawsons took Sab home to meet their children and two other rescue dogs, Tarka and Abby. At first, Sab practically lived under the Lawsons' kitchen table. 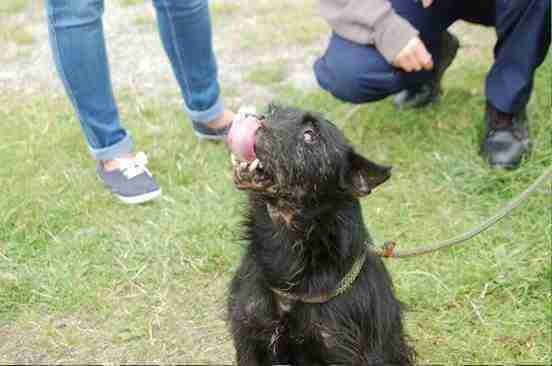 "He just wasn't like a dog should be," Natalie Lawson tells The Dodo. "He didn't know how to play or be around people." To help Sab adjust to his new life, Paddy sat under the table with him, stroking Sab's fur and letting him know he was loved. 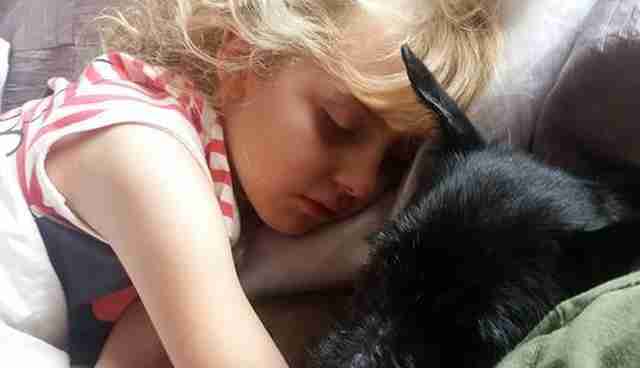 Slowly but surely, Sab gained confidence and started to follow Paddy anywhere he went. He also became fast friends with Tarka and Abby, and the Lawsons' children. "Once Sab came home," Natalie says, "it was very clear that Paddy would not be able to part with him." 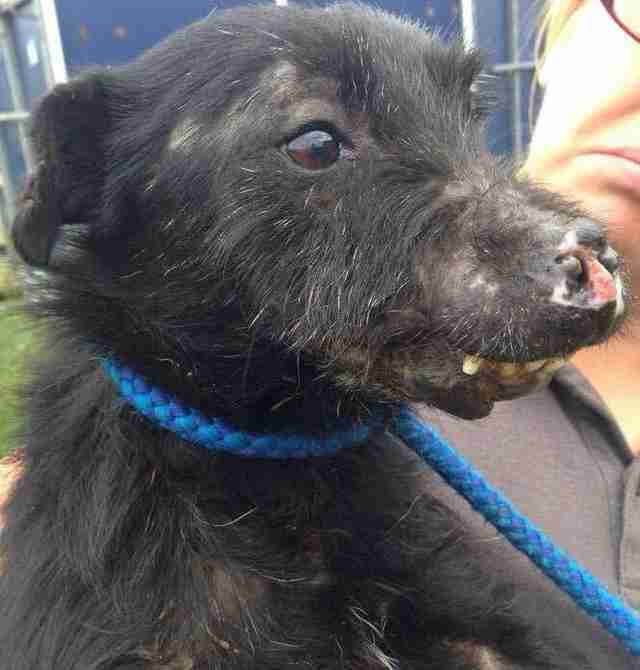 Now Sab didn't just have a foster home - he had a forever home. But he still had lots of physical issues to overcome. Besides the injuries to his nose and mouth, Sab had old wounds on his neck and backside, which the vets said could take years to heal. Sab also needed expensive dental surgery, but the Lawsons were able to make this happen with generous donations from the public. Even with this dental surgery, Sab will always have a snaggle-toothed look. Natalie explains that Sab will also continue to have breathing problems because of his nose injury: "He blows little snot bubbles whenever he's excited." But to the Lawsons, he's perfect. Or maybe perfectly imperfect. The Lawsons entered Sab into the RSPCA's Ruff's Alternatives Dog Show's "Perfectly Imperfect" category, which offers prizes for "'wonky' dogs who will never be 'perfect' according to a set of 'breed standards' - but are perfect in your eyes." Not surprisingly, Sab was chosen to be a finalist in the competition. When the 10-hour voting period started on a Sunday, Paddy and Natalie sat by their phones and laptops, anxiously awaiting the news. "We all refused to go to bed until we knew if Sab had won or not," Natalie says. "The whole time, Sab remained at our sides." At 10 p.m., the Lawsons got the news - Sab had won. "Sab was so excited when we got the news," Natalie says, "but it was probably because we were making a massive fuss over him." To learn more about Sab or donate to his vet bills, go to his Facebook page.